LED BY CONTROVERSIAL VOCALIST Billy Corgan, in 2007 the re-united and re-vamped multi-platinum band Smashing Pumpkins burst back into the limelight at two residencies  one in Asheville, North Carolina, and the other in San Francisco, California, marking a return to the US music scene. 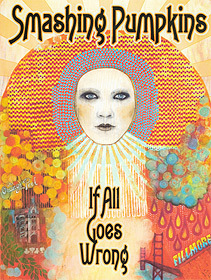 The Smashing Pumpkins: If All Goes Wrong is a double DVD commemorative package presented by Coming Home Media  a beautifully-shot, 105-minute documentary on the first disc and a live show on the second disc that offers a rare insight into the making of their latest album Zeitgeist, followed by a fourteen-song concert recorded live at the Fillmore Auditorium in San Francisco featuring six previously unreleased tracks. Containing over four hours of material, this release celebrates the reunion and the extraordinary twenty-year career of the Smashing Pumpkins, said to be one of rock's defining and most acclaimed bands. Belgium's most prominent annual film event, The Ghent Film Festival, screened If All Goes Wrong in October (2008) as part of the iTunes music documentary competition. 22 June, 2007, sees the Smashing Pumpkins arrive in Asheville for a residency at The Orange Peel club following a successful European tour. The documentary follows Smashing Pumpkins on the road and at their residencies, featuring fans, associates and characters the band meets. It captures the band at a moment of unprecedented creativity, crushing uncertainty and undeniable gravity and opens up Smashing Pumpkins  especially Billy  to intimate exposure. The talented and musically-savvy Smashing Pumpkins line-up is: Billy Corgan (Guitar, Lead Vocals), Jimmy Chamberlin (Drums), Jeff Schroeder (Guitar), Ginger Reyes (Bass) and Lisa Harriton (Keyboards). There are interviews with band members, managers Jared Paul and Paul Geary, fans, journalists and fellow musicians who reveal the fears, excitement, determination, exhaustion and tension inherent in main singer-songwriter and lead guitarist Billy Corgan and his newly revitalized musical unit. The now-expected F-word drops in occasionally! Billy's songs reflect moments in history and his life experiences, including the sadness of his childhood. He can turn out a new song for inclusion in the Smashing Pumpkins' act almost overnight and we see him at his creative best, capturing the energy coming off the street. The band talks of past members James and D'Arcy and their highs and lows and their expectations. For all their bravado, Billy and his band seem, at times, quite vulnerable and sensitive. 14 July, 2007, sees the band arrive in San Francisco  four days after the Smashing Pumpkins release their first studio album in seven years: Zeitgeist. The scenes around the club are fascinating as is the contrast of modern day San Francisco with the city of 1906. The second disc covers over two hours of full concert footage from the Fillmore Residency, filmed in late July and early August from five of the eleven sold-out nights. It is very visual and dynamic, with a sparkling performance from Smashing Pumpkins. Billy Corgan's fine voice and his thought-provoking lyrics are appealing  especially on Peace+Love, a good track with great musical input that includes a harmonica. As Billy tackles each track with gusto  the dramatic and inspirational Lucky 13; melodic and heartfelt Death From Above; the first class and lovely to listen to Gossamer; the quirky Heavy Metal Machine and upbeat, catchy Untitled  you can appreciate the musical ease with which the band plays. "We went into the residencies hopeful to play some new music, with the idea I could write during the day and we could maybe even play new songs that same night," says Billy Corgan. "What I didn't anticipate is how much the process would inspire me, positively and negatively, to report what I was seeing and feeling from the shows. The documentary shows that process in an interesting way that reveals the link between the band and our audience." It is great to hear those beautiful, long music introductions with a strong input from drums and the band plays extremely well. Zeitgeist is simply captivating. This package is superbly presented and is a great addition to any fan's collection. The Concert disc is 5.1 Surround Sound; state-of-the-art high definition from twelve cameras and features seven all-new tracks not available anywhere else, along with new versions of fan favourites and a selection of Smashing Pumpkins rarities.  Coming Home Media is proud to release Smashing Pumpkins: If All Goes Wrong, a two-disc DVD set with over four hours of content, including the band's first concert release, on 1 December (2008). Certificate: E (Exempt) | DVD Running Time: 271 Minutes (Approx) | Catalogue No: CHS 10036 | Barcode: 4046661141092 | UK Distributor: Pinnacle. 14 Gossamer* | 15 Zeitgeist. *Previously unreleased tracks. Disc 1, The Documentary, is Directed by Jack Gulick (Bruce Springsteen, Metallica, Steve Miller Band, Godsmack); Produced by Daniel E Catullo III (Steve Miller Band, Godsmack, Rush, Dave Matthews Band) and Jack Gulick. Included are live concert segments from The Fillmore Residency Directed by Daniel E Catullo III. Original score is by Billy Corgan. Disc 2, The Concert, is Directed by Daniel E Catullo III; Produced by Jack Gulick and Daniel E Catullo III; Edited by Chris Lovett. Orginal Poster Art created by Craig Howell. DVD Design: Illustration and Design is by Linda Strawberry; and the Package is designed by Rodney Bowes.